Modified ILLUSTRIOUS Class Fleet Aircraft Carrier ordered under 1938 Programme from Fairfield Shipbuilders, Govan, Glasgow In October 1938. The ship was laid down during February 1939 and launched on 10th December 1942 as the 4th RN Warship to carry the name. This name was first used in 1805 for the French 74 gun DUGUAY TROIN captured on 3rd November after the Battle of Trafalgar. This name was previously used by a battleship built in 1899 and sold in 1921. Build was completed in June 1944 and she had been 'adopted' by Lloyds of London after a successful WARSHIP WEEK National Savings campaign in March 1942. July Embarked aircraft and carried cut work-up at Scapa Flow with Home fleet. August Work-up in continuation and joined Home Fleet on completion. September Deployed for air attacks on shipping off coast of Norway. Aircraft carried cut attack on coastal convoy sinking 3 mercantiles and 3 small escorts. October Home Fleet deployment in NW Approaches and North Sea. Norwegian coast shipping (Operation ATHLETIC). Air attacks made on airfields at Sorreisa and Bardufoss. Reconnaissance aircraft sighted TIRPITZ in new berth near Tromso. VENUS, VERULAM, VOLAGE, ALGONQUIN (RCN) and IROQUOIS (RCN). Air attacks made on shipping off Bodo and Rorvik. Depot Ship KARL MEYER destroyed. November Home Fleet deployment in continuation. Carried out attacks on convoy off Masjoen, north of Namsos. Norwegian ships RIGEL and KORSNES sunk. (Note: These ships ware carrying Russian prisoners many of whom were killed). Two Flak ships escorting convoy were also sunk and the freighter SPREE at anchor. an air minelay in Kara Sound (Operation URBANE - Designated as Force 1). No ships ware found. For details of air minelaying see Naval Staff History (Mining). 8th Air attacks made on shore targets between Bergen and Stavanger. Nominated for service with British Pacific Fleet and took passage for refit. February Prepared for operational service with US Fleet in Pacific. March Honoured by Royal Visit during which an Investiture was held. Embarked aircraft at Scapa Flow and took passage to Ceylon. 4th Arrived in Ceylon and flew off aircraft for use ashore. Took passage to Australia to join British Pacific Fleet. 8th Arrived at Sydney and joined BPF. Allocated for service in Task Force 111.2. 12th Sailed to carry out an attack on Truk. 111.2.3 to cover air operations. 14th Carried out air attacks on Truk with HMS RULER, escorted by HMS TERPSICHORE. (Operation INMATE - See THE FORGOTTEN FLEET by J Winton). 15th Continued air attacks on Truk in adverse weather. Six aircraft were diverted to land on HMS RULER. Provided aircraft spotting facilities during bombardment by the cruisers and the destroyers. (Note: The bombardments were not successful due to inexperience of personnel). 17th Returned to Manus with Task Force. Transferred to US 3rd Fleet after reorganisation of US Naval Command in Pacific. 28th Sailed with TF 37 for Manus. 6th Deployed with US 3rd Fleet. HM Battleship KING GEORGE V as Flagship. HM Aircraft Carriers FORMIDABLE, VICTORIOUS and IMPLACABLE. HM Australian Destroyers QUIBERON, QUICKMATCH, QUALITY and QUADRANT. After departure machinery defect made reduction in speed necessary. Detached for repairs which were completed without need to return to Sydney. 16th Rejoined Task Force before start of joint air operations with US 3rd Fleet. 18th Air operations continued with replenishments from Fleet Train (IF112). 31st destroyers were damaged (one sinking later). Successful air strikes in Inland Sea sank merchant ships and warships. August Air operations off Japan in continuation. 3rd After replenishment period further air operations were Interrupted by threat of typhoon. to North Honshu and Hokkaido. 12th Withdrawn from operational area due to lack of fuel from British sources. Took passage to Manus with British ships not designated as Task Group 38.5 with 3rd Fleet. 57 by P Smith, THE FORGOTTEN FLEET by J Winton and Naval Staff Histories). 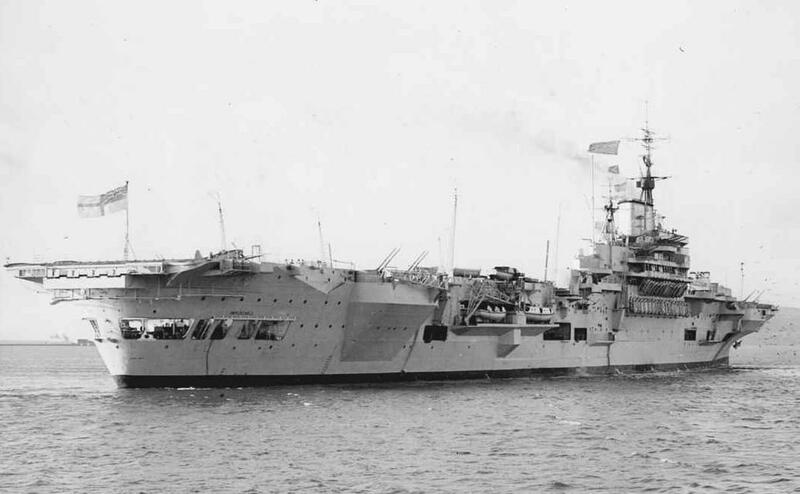 HMS IMPLACABLE landed her air crews and aircraft in Australia and was converted to accommodate passengers. She was then deployed for repatriation of British POW and embarked 2,127 at Manila to take passage to Canada arriving at Esquimalt on 11 October 1945. In January 1946 she visited Melbourne with HMS INDEFATIGABLE and sailed for UK in May, arriving in June that year. The ship was placed in Reserve and refitted before joining the Home Fleet as Flagship in 1949. Due to manning problems during 1950 many Home Fleet ships had to be withdrawn from service and HMS IMPLACABLE was deployed in the Training Squadron and continued service in the training role until 1954 when placed in Reserve. Placed on the Disposal List she was sold for breaking-up at Inverkeithing, Rosyth arriving at the breaker’s yard on 3rd November 1955.